Imagine sipping chianti at a rustic winery overlooking acres of vineyards as the Tuscan sun slowly slips below the horizon. Envision snapping photos of beautiful Italian farmhouses in the pre-dawn light as fog slowly rolls over the hills and through valleys in the heart of Tuscany. Picture strolling through the ancient cobblestone streets of Renaissance-era villages in the fading light as Italian families dine together with fresh pasta, cheeses and the ever delicious wines of Tuscany. 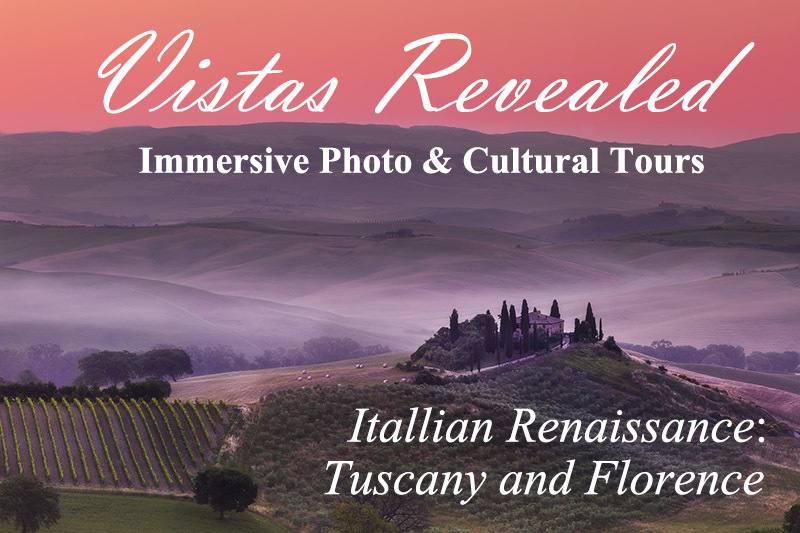 Experience all this an more on Vistas Revealed Italian Renaissance Photo & Cultural Tour. Photo © copyright by Ted Davis.